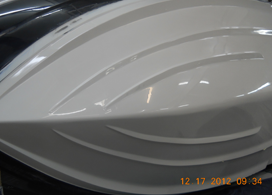 Taking your fiberglass boat out on the many waterways and lakes of St Paul MN? If so, you may have occasion to need boat repair. It’s easy to inflict some damage on a boat and when you do, the experienced boat repair technicians can help. The boat repair pros at Anchor Marine know how important your watercraft is to you. These technicians know that a boat is a major investment and we want to help you protect it. Think about it…. Every day, most boats endure a cycle of temperature and humidity changes, from cool and damp nights to hot, dry bright sun. This expansion and contraction, wet-dry daily cycling, occurring even on days with the best boating weather, takes a toll on gel-coat and wood bright work. Add pollution, dirt, rodents, bird droppings, the occasional raging hailstorm and who knows what else, and your expensive, prized possession is under siege. It’s a proven fact that a fiberglass boat depreciates faster than a car but that has little to do with the boat manufacturers. The facts are, boat depreciation usually occurs when boats aren’t taken care of properly. If you purchased a used boat or want to improve your boat care, we can offer a free assessment. Anchor Marine’s team of experts can refinish gelcoat, apply polyflake, refinish fiberglass and even professionally match gelcoat colors. We repair chips, scrapes, holes and can also address dock rash. 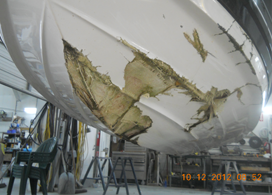 Damage to a fiberglass boat can be caused by even minor collisions, wind, storms, sun and of course, people. We can handle that every type of boat repair—even structural repair! Anchor Marine offers pick up and drop off services as well. Call the experts at Anchor Marine Repairs at (763) 972-3540 Monday through Friday from 8am to 5pm and on Saturdays 8 am to 12 noon. You can also email us at anchormarine@frontiernet.net. The workshop is located at 667 Babcock Boulevard Delano, MN 55328. Anchor Marine Repair proudly supports the residents of St Paul MN. Our knowledgeable staff focuses on structural repairs to fiberglass, metal flake repair and all other types of aluminum boat repair. We have experienced boat repair technicians who are committed to restoring your boat to pristine condition.